Do you want to help the youth in your life find more confidence and peace? Do you want to help children and teens be more compassionate towards themselves and others? Do you believe that early implementation of healthy body/mind habits sets humans of all ages up for success? This Training is a great way to learn how mindfulness and movement practices physically change the brain- improving memory, impulse control, decision making, attention, and learning. Learn how to share the magic of mindful movement with youth, and help students grow to be the best versions of themselves, cognitively, physically, and emotionally. 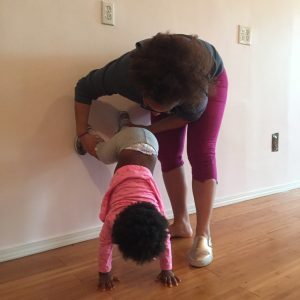 Harlem Yoga Studio has been committed to being a space where the WHOLE family is welcome and thrives. After working with families for 10 years and a wonderful first round, we are thrilled to announce our second Kids Yoga Training based on our experience working with kids, and the expressed needs of families and schools. *15% off with Valid Teacher/Admin ID – email us at KIDS@harlemyogastudio.com to obtain discount. **Please follow both links to both apply and register to hold your spot. You will receive confirmation after both actions are completed. In addition, participants are asked to observe an additional kids yoga class. Harlem Yoga Studio will be hosting our annual 200 Hour Yoga Alliance Certified teacher training starting in September 2019. To meet our Teacher Trainers and learn more – join us at our OPEN HOUSE! HYS has been dedicated to making Yoga Accessible, Welcoming, and FUN for 10 years, since its founding in 2009. Here students can find a class to suit their needs ,no matter their level, age, experience, or body type, and connect not only through practice, but also through ties to our larger community. A 200 hour TT is an amazing way to deepen your practice, broaden your knowledge of the 8 limbs of Yoga, learn how to bring the physical and mental benefits of yoga into your community, and obtain a solid foundation for teaching Yoga Asana that is Accessible, Welcoming, and Fun for EVERY body! In addition to a solid foundation that will allow you to confidently begin your journey teaching both new and more advanced students, the training will give you a unique introduction and opportunity to explore; Trauma Informed Yoga, Yoga that addresses the needs of a variety body types and abilities, anti-racism and diversity in the yoga classroom, and how to Build Community through Yoga. My experience in the HYS TT was beyond what I expected. This training not only helped me learn everything I need to start my path as a yoga teacher, but it also connected me with extraordinary human beings. I felt part of a wonderful community. Last fall I googled “yoga training NYC” and Harlem Yoga Studio popped up. It was meant to be. I live in the neighborhood and I had taken my son to the toddler and me classes when the studio opened 10 years ago. I immediately signed up and the training was above and beyond what I expected. The teachers are aHHHmazing. I learned about yoga asanas (poses) and philosophy. In all my years of fitness I always went to the fast, high energy classes. This training taught me that the yoga my body needs was not the yoga I had been chasing. They have created a training that is a haven and a safe space. Erica, Amy and Vijay along with the teachers that are brought in for the specials opened my eyes, mind and heart to so much beyond “fitness”. Yoga is a powerful tool for connecting people and Harlem Yoga Studio is dedicated to their students and the community. 10.31.19 Thursday 6:10 – 9:10 PM Halloween! 12.19.19 Thursday 6:10 – 9:10 PM Closing Ceremony/ Graduation Party !! This training is designed for Vinyasa teachers who wish to implement a sound and sensible approach to hands on adjustments in their classes and privates. We will utilize Katonah Yoga theory, tools, and techniques, to explore effective ways of using our minds, eyes and hands when guiding our classes. Touch can be a powerful and effective tool when it is warranted and consented to. We are three dimensional beings, each with our own unique understanding of the body and the world around us. Developing an eye for asana and embodiment is a big piece of the picture when approaching and applying hands on adjustments. It is not an arbitrary practice and must be studied with care, caution, humility, and grace. In this training we will explore geometry, accessible alignment, and the archetypes of asana, in a common sense way that will leave with you a deeper understand of the human body in motion in a yoga class. At the end of the training you’ll have a new tool box to pick techniques from for both your classes, personal practice, and life. Katonah Yoga is a syncretic Hatha yoga practice developed by Nevine Michaan over 40 years. 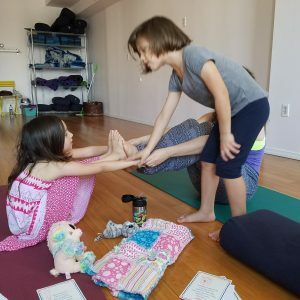 She and her teachers incorporate classical Hatha yoga with Taoist theory, geometry, magic, mythology, metaphor, and imagination — in a practical framework designed to potentiate personal and communal well-being.Framing the practice, maps of time and personal space are defined and refined. Themes using asana as origami, manipulating form for function, and developing a sense of personal measure are incorporated in Katonah Yoga practices. Disciplined techniques are organized for revelation through revolutions.This training is open to all teachers from any discipline. Join us for the Exhale to Inhale trauma-informed yoga teacher training! The training, facilitated by Exhale to Inhale Teacher Trainer Tara Tonini, includes 17 hours of lecture/experiential learning, a training manual, on-line community for sharing & networking, and access to videos / audio for continuing education. Graduates will receive a certificate of completion from ETIThis training qualifies for Yoga Alliance continuing education credit. Learn more and register here.Scholarships & payment plans available. Contact: info@exhaletoinhale.org for more information.